Two-stage skid mounted Mueller Accu-Therm AT40 with 76mm BSM connections. TERALBA Industries has expanded its range of Mueller Accu-Therm plate heat exchangers, with the introduction of stainless steel terminal blocks to provide multiple stages of heating and cooling within the plate heat exchanger frame. The new terminal blocks allow a fluid stream to be cooled using various cooling media to minimise energy and refrigeration costs. For example, a three-stage Mueller plate heat exchanger with one terminal block and divider plate can be used to cool a product fron 80°C to 45°C, using the comparatively cheap cooling source of a cooling tower with water at 30°C. In the second stage, the product is cooled from 45°C to 12°C, using chilled water at 8°C. With the bulk of the energy removed from the product, the final stage requires only a low flow rate of chilled glycol at -2°C, to obtain the desired product temperature of 2°C. 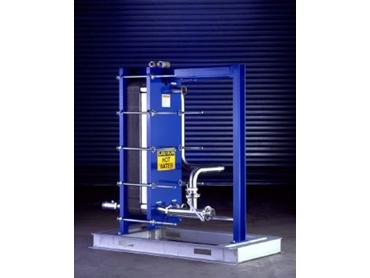 Four models of the new multi-stage plate heat exchangers are available from 25mm through to 100mm, to suit a variety of flow rates. The new stainless steel terminal blocks, along with most of the Mueller Accu-Therm plate heat exchanger ccmponentry, is manufactured by Teralba Industries under licence from Paul Mueller Company. Teralba Industries 02 4626 5000.